Techie Beginners | For those interested in learning computers, blogging, and other techie stuff. Normally, I am well “behind the times”. Today, or let’s say, yesterday, I’m actually right on-par, keeping up with the “in crowd”. Going against my usual principles of letting someone else be the guinea pig, I went ahead and got Windows 10 the instant it was available. A little backstory… I was familiar with Windows 98 and had it for several years. I had Windows 2000 and used it at work and school for several years. Then, eventually, we upgraded to XP and I used that for several years. I was reluctant to change to XP, but glad when I did. Then I bought a new computer and it had Windows 7 by default, so I had to get used to it. Note, I did not mention Windows ME or Vista. Granted, I also didn’t mention 95, 3.1, or NT, but that’s because those were in my pre-computer days. That said, ME and Vista I didn’t mention because I loathed them. I didn’t have them because I did not want them. I did have brief experience with each and it further solidified my reasoning to avoid it. Yes Windows, I wouldn’t have clicked it if I didn’t want to! So here I am today, on a brand new laptop which I bought with (ugh) Windows 8 (8.1, to be specific). While I don’t consider (my brief experience with) Windows 8/8.1 to be as bad as some people seem to think it is, I still could not go with it as my primary. So, when I had the opportunity to upgrade to Windows 10, I took it. The Start button on Windows 7 and Vista is quite fancy. A little less fancy, don’t you think? 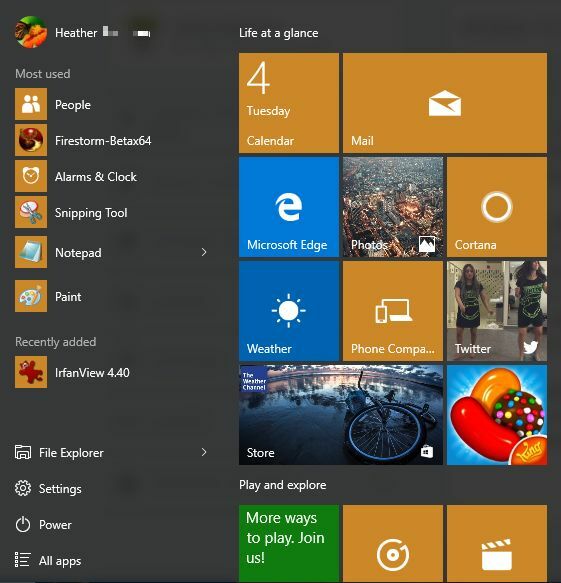 Now, technically on Windows 8.1, there is also a “Start” button shaped like a house, but the above is what you are stuck with. Likewise, it is evident on all your other screens. It honestly, to me, looks like a hybrid between Google’s new Material design, and Ubuntu 14.0.4 LTS. I can’t say that it’s great having a flashy new piece bland, I do appreciate the large, spacious images, buttons, and text that comes with not only the new operating system but also the corresponding apps. If there is one thing that I hate about this new version, it’s that it is a progression of further dumbing-down their software. Microsoft tends to have the impression that its users need their hand held through every step of the process. While that may be useful for some, it is incredibly obnoxious to others, particularly if you do know what you’re doing and can no longer find what you need. In pretty much every version of Windows up until 8, you could tell anyone to go to “Start” > “Settings” > “Control Panel” and/or “Start” > “Control Panel”. In Windows 7, it was a direct option from Start, so it was even more handy. In Windows 8.1, Control Panel still existed, with only a little hunting. In Windows 10, Microsoft is trying to convince me they got rid of it. Do you see “Control Panel” anywhere? It is still around, but you have to hunt for it. The easiest way I found is to open File Explorer, and simply type “control panel” in the address bar. You will then reach ol’ faithful. Also note, you cannot stop Windows from auto-updating on this version (short of being offline). 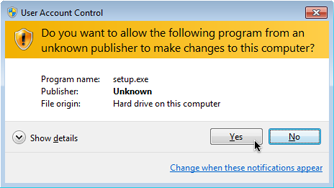 I’m sure there’s technically a way, but the general setting in Windows 10 is to disallow the user from cancelling any update. Your options are “Automatically Install” or “Notify Me When to Restart”. Thanks Microsoft. Also take note, installation/upgrade alone is a lot different. The “Express Options”, which it of course prompts you to use, are defaulted to allow all information – searches, possible malware, etc, – to be sent to Microsoft. This is under the guise of “helping to improve the software”. The option to change the settings before you upgrade is available, but it’s in small type on a link – basically, they want you to miss it. Additionally, Windows 10 will automatically come with Microsoft Edge, Windows new browser. Internet Explorer is still installed but your task bar icon for Internet Explorer will be replaced by an icon for Edge. Edge follows the same simplistic look and feel of Windows 10 and seems to have few options for tweaks and settings. Again, I do appreciate the open space and large fonts/images, but I question the lack of control and flexibility in configuration. I haven’t had Windows 8.1 long enough to comment much on it, and I’ve had Windows 10 for even less time. 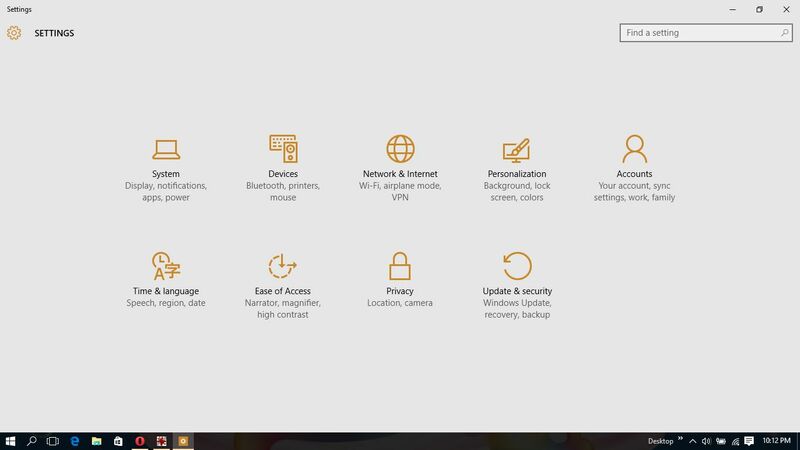 I greatly dislike Microsoft’s push towards a simpler and simpler layout that reduces flexibility and user control over their own computer. It almost has a feel of software that’s borrowed, rather than owned. However, I do prefer the general look, feel, and options to Windows 8.1, though I still love my Windows 7. 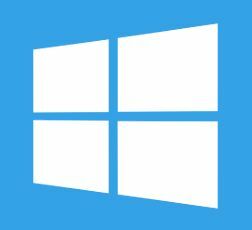 All users of genuine Windows 7, 8, and obviously 8.1 will have the option for a free upgrade to Windows 10. What do you currently use, and are you looking forward to (or have) the upgrade? Let me know your thoughts in the comments below! My inspiration to write this post comes from something stupid I was just doing in Photoshop. But first, let me share a story with you. I promise it’ll be brief because I don’t remember any of the details. The tech support went over the usual basics, which he confirmed he had already tried. They had to send someone out to his home. Even though this isn’t an Apple blog, I am adding bits about the iPod as I learn to use it, like how to stop the screen from rotating.